I'm talking about staying on the sidelines of today's rally. If that's you, listen up... You haven't missed it. Sure, it's been a record-setting year in the markets so far. We experienced the best January for equities in 30 years. February led to more of the same, with stocks continuing higher. And recently, the tech-heavy Nasdaq Composite Index moved higher for 10 weeks in a row. Recently, the extended rally hit another incredible mark we haven't seen in nine years. It has only happened 11 other times since 1928. You see, following the trend is at the core of our investment criteria. Without an uptrend, we're not interested. One way to define an uptrend is by tracking stocks against a moving average. This tool tracks the average closing prices over a given period to "smooth out" volatility. If the stock price is above its moving average, that signals an uptrend. And if the stock price is below its moving average, the trend is down. You make the most money when prices are above the long-term moving average (usually the 200-day moving average). But looking at short-term moving averages is useful, too. Stocks stayed above this short-term moving average for most of January and all of February. Since 1928, buying the S&P 500 after similar occasions would have led to winning trades one year later 64% of the time. And importantly, history shows a 10%-plus rally is possible from here. Only four of these instances led to losses a year later. And the biggest was a loss of just 7%. That means the risk of a major decline is small, and the possible upside is large. You see, the winning trades outweighed the losers. Seven of the 11 extremes led to double-digit rallies over the next year. And the biggest return was 22%. So, it's true that U.S. stocks have had a stellar start to 2019. We saw the best January for stocks in more than 30 years. But that doesn't mean the fun is over. 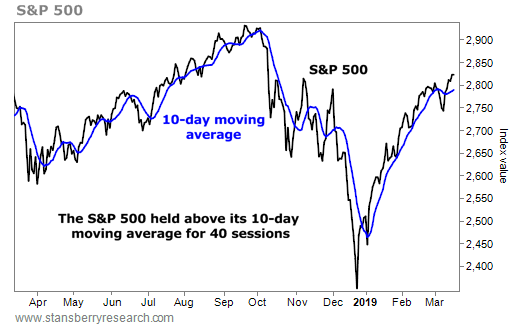 This occurrence is one more reason the gains in stocks should continue this year – and this decadelong bull market isn't finished yet. Don't let fear keep you on the sidelines today. You want to own U.S. stocks right now. And history says double-digit gains are possible from here, thanks to this rare event. 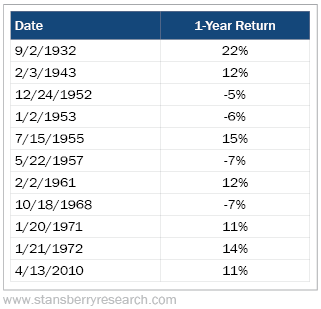 "Some folks assume the market can't be in a better spot after a rally than it was before it began," Steve writes. "This thinking may seem to make sense... But it's wrong." Get the details on one of his favorite indicators of market health here: U.S. Stocks Are as Healthy as Ever... Seriously. "It's become an old cliché... 'Buy low and sell high,'" Brett says. "But investing doesn't usually work that way." Read more about a recent event that points to an opportunity to "buy high and sell higher" right here. 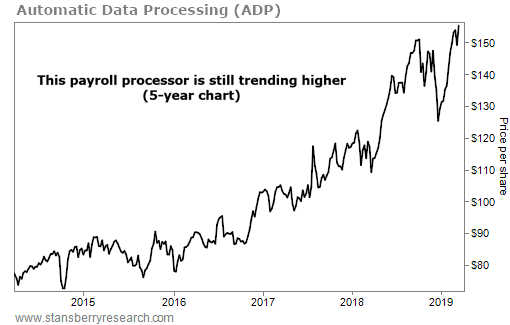 Automatic Data Processing (ADP) is the largest payroll provider in the world. It’s where businesses go to outsource their payroll and tax-filing needs. More than 740,000 clients rely on ADP to handle these crucial services – so it’s no wonder the revenue keeps rolling in… In the second quarter, ADP reported sales of $3.5 billion, up 8% from the same period in 2017.